What woman doesn't have an abundance of bath and beauty products stashed away? Those tubes and bottles look so fresh and promising in their gifty splendor, then languish in a drawer somewhere. My bathroom only has a small shelving unit above the toilet. Where would I ever get such a narrow container to hide all this stuff? That looks really nice! I like the idea of putting all the small things in such a pretty can. I have several "Avon" ladies in the family and I have TONS of bottles of goos and gels. You have inspired me! That looks beautiful! What a wonderful display. Good idea again!! 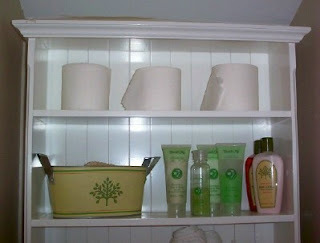 I even got containers this Christmas but never thought to ues them in our bathroom! You are a God Send! !